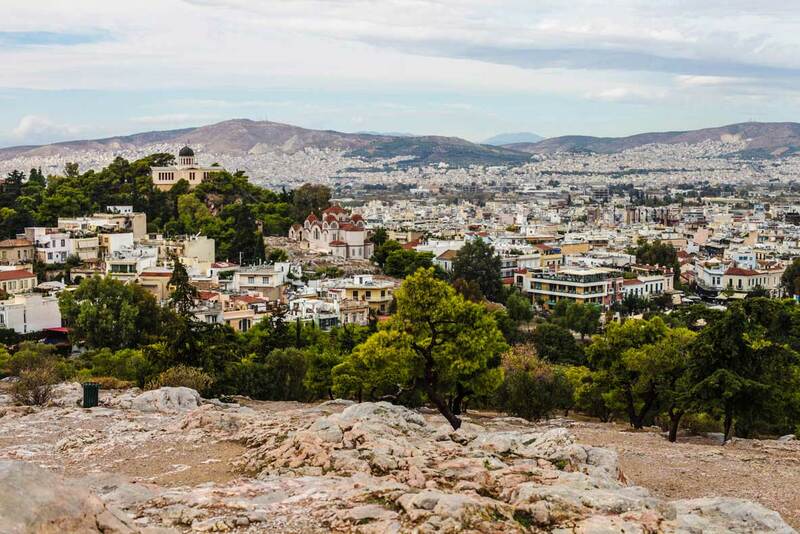 Athens is a beautiful city, steeped in history and culture. 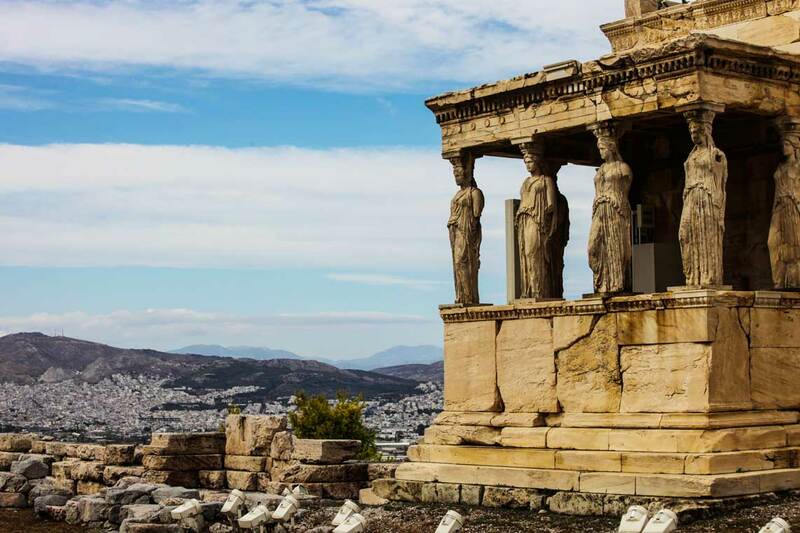 Learn about the customs of ancient Greeks, engage in a democratic debate or philosophize the morals of your friend who ate the last piece of baklava during a visit to the city’s world famous archaeological sites. 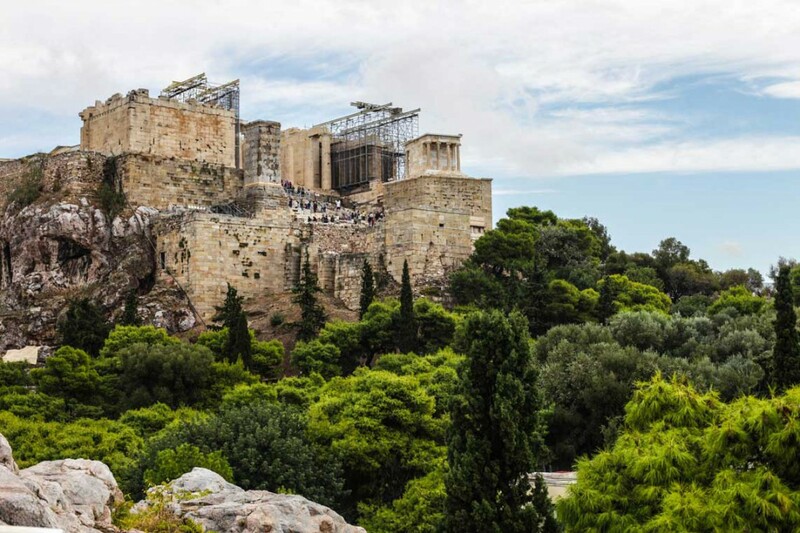 For just €12, you’ll gain access to some of the city’s most famous landmarks, including the Acropolis where you’ll also get a spectacular view across the city. For information on opening hours, free admission days and reduced price tickets, visit the Ministry of Culture and Sports. Remember to wear comfortable and supportive shoes (no flip flops) as you’ll be doing a lot of walking! A view of the Acropolis from half-way up the ascent. 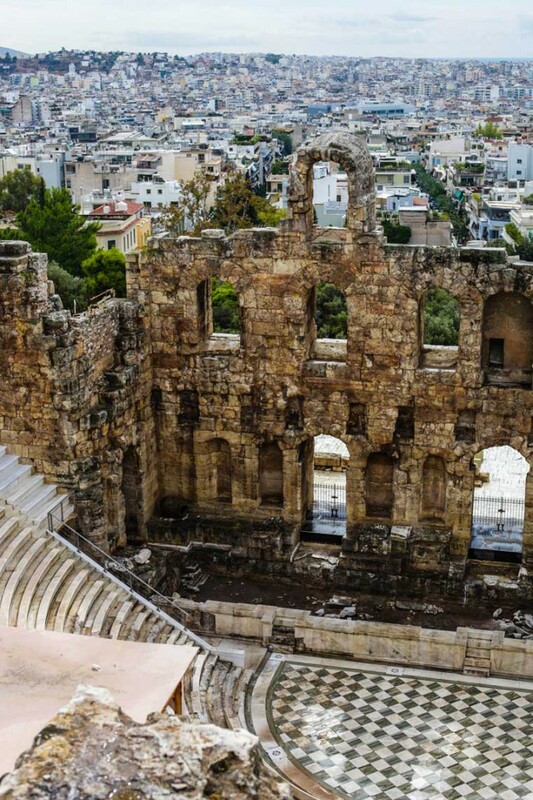 The Odeon of Herodes Atticus is situated at the bottom of the Acropolis and can be seen from street level and from above. The Caryatid Porch of the Erechtheion and a remarkable view across the city. 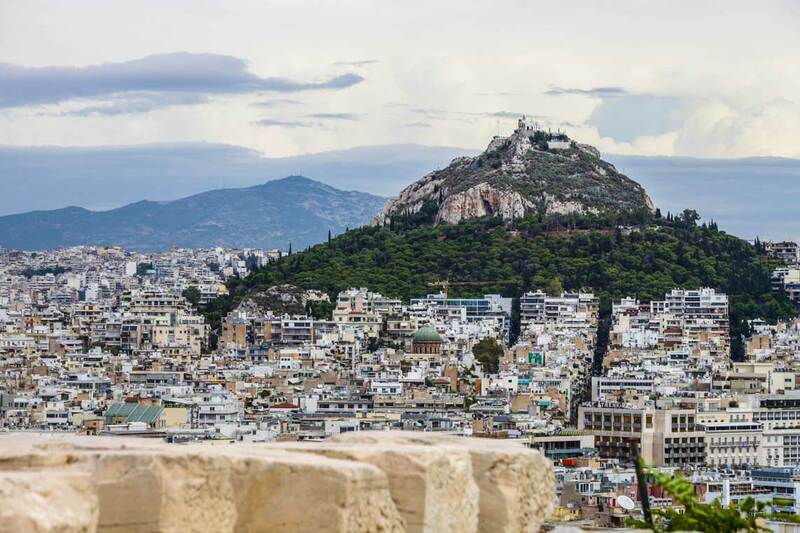 Learn about what life as a local is like and get insider tips on the best things to see and do through the This is My Athens program. 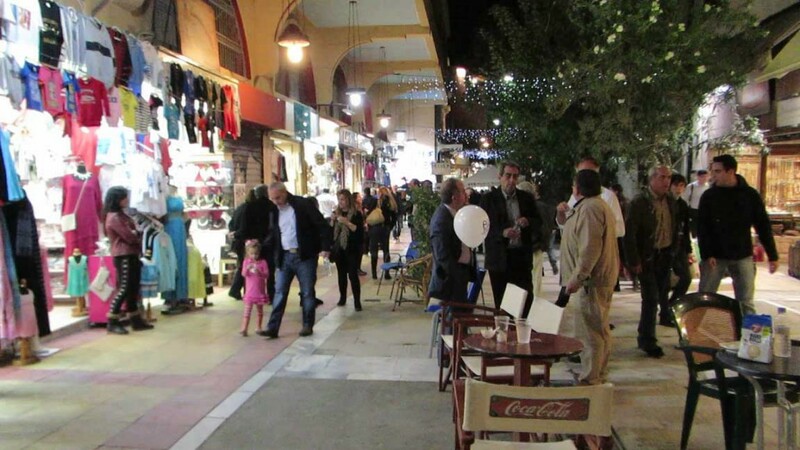 This free initiative, founded by the Athens Development & Destination Management Agency (ADDMA), will partner you with a local volunteer who will show you around, answer questions you have about the city and culture, and make recommendations on great things to see and do during your stay. Hands down, this is one of the best ways to experience Athens and I would highly recommend it. To find out more about what you can expect, read about my experience. To have your own adventure with a local, simply sign up at least 72 hours in advance of your arrival. My This Is My Athens guide, Paolo, took me on a tour of the city and answered all of my questions (and there were a lot)! The food in Greece is really tasty and very reasonably priced. For a relaxing, tapas-style meal, stop at a tavern and order a selection of Greek delicacies. I recommend trying fried zucchini balls stuffed with melted cheese and herbs, moussaka, fried Halloumi cheese, red peppers stuffed with rice and beef, and, of course, traditional Greek salad. I highly recommend you try as many of the local dishes as possible – they’re all so tasty! 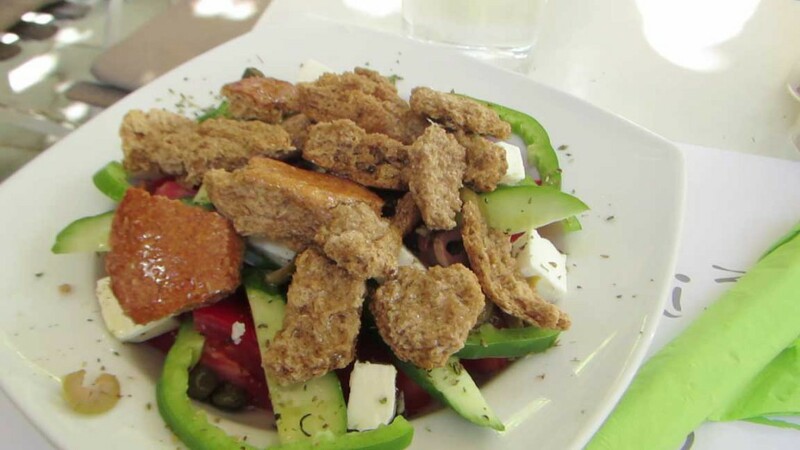 This Greek salad was made using green pepper, tomatoes, cucumber, olives, Feta cheese, dried oat bread, olive oil and herbs. You’ll find street art and graffiti everywhere you go in Athens and each piece has it’s own unique story to tell. Spend an afternoon wandering through the city streets in search of masterpieces or take an organized tour to learn about the stories behind them. Athens is covered in colourful pieces of street art and graffiti. Looking for interesting pieces is a great way to discover the city. 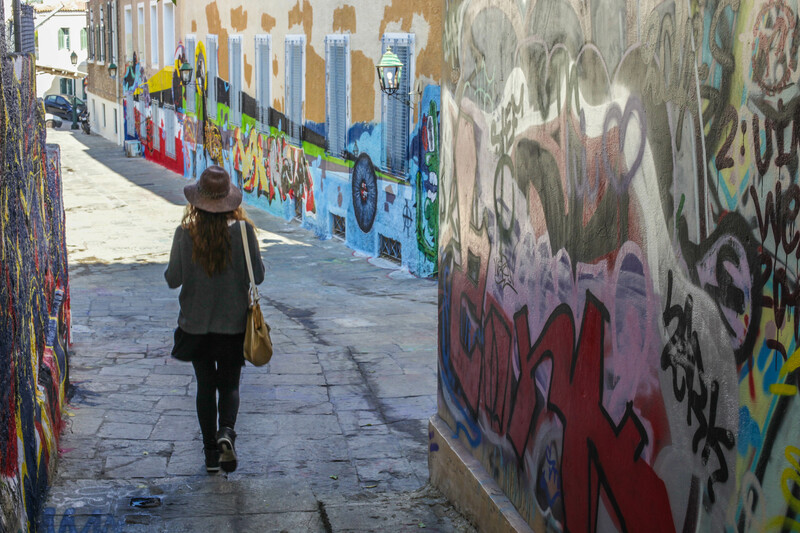 Check out this colourful alleyway in Athens! 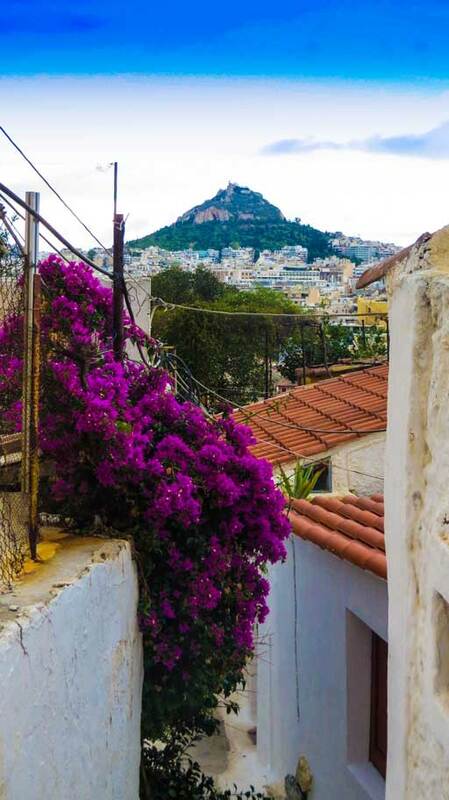 Underneath the Acropolis, in the old Plaka neighbourhood, you’ll discover Anafiotika, a community of 45 whitewashed houses and tiny alleyways carved out of Acropolis rock. The architecture in this neighbourhood is reminiscent of that on the Cyclades Islands and will make you forget you’re only minutes away from the bustling city centre. 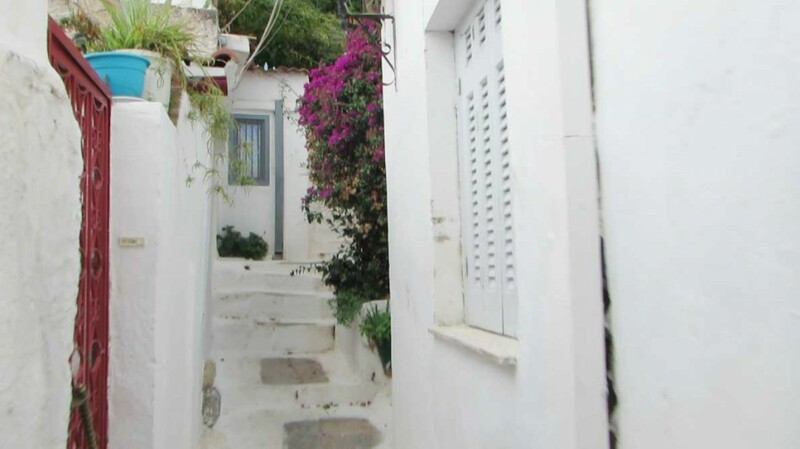 In the foreground, you see the whitewashed facade of the houses in Anafiotika. In the background stands Lycabettus Hill. This winding alleyway in Anafiotika was carved out of Acropolis rock. Athens is home to some fantastic bars and pubs. 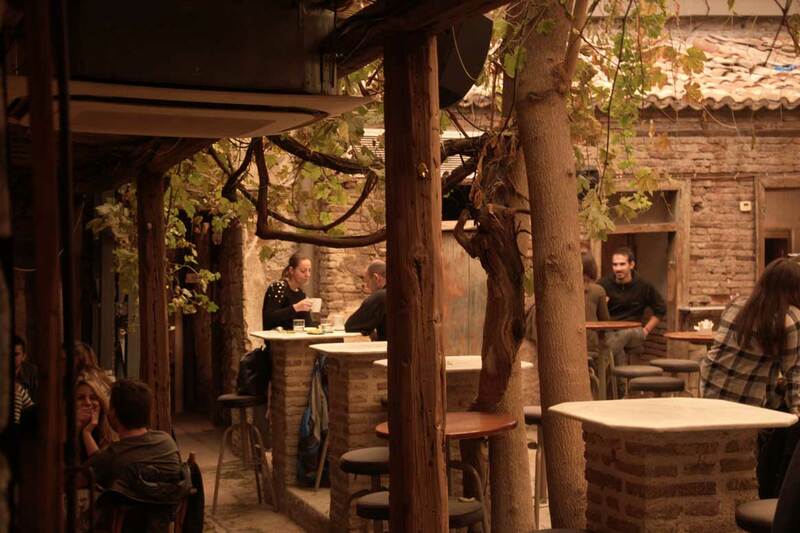 Grab a drink with a view of the Acropolis or check out one of the city’s many themed bars, like Poems and Crimes – a great place to get in touch with your inner creative over a coffee or beer. If you’re in the mood to get your groove on, check out Six d.o.g.s to go dancing with the locals. 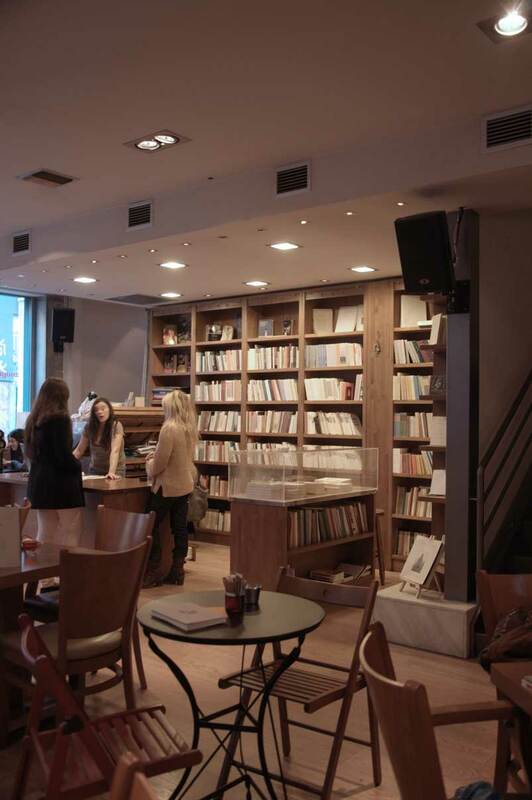 Writers and creatives alike will enjoy checking out Poems and Crimes for a creative work-space during the day and a hip place to go for live music in the evening. Photo provided by Paolo Todesco. The inner courtyard at TAF is surrounded by small art galleries; trees grow through the floors giving the space a feeling of the outdoors. 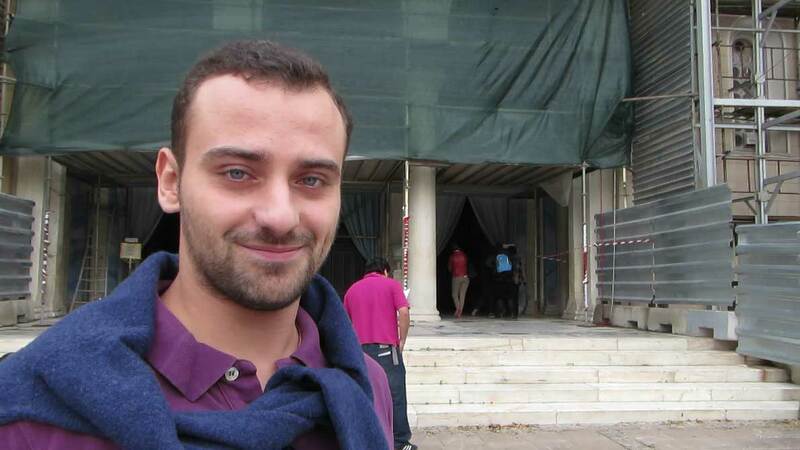 Photo provided by Paolo Todesco. No visit to Greece would be complete without a drink of Ouzo. Although it’s got a love-it-or-hate-it aniseed flavour, it’s certainly a must-try activity when you’re in Greece. The Greeks traditionally serve ouzo in a tall glass filled with ice and sip slowly at their drink. If the strong taste is a little too much though, then try a sip of Tsipouro, a pomace brandy that’s also made in Greece. Both of these clear spirits are strong (40-45%), so pace yourself and remember to drink lots of water – fortunately it’s Greek custom to serve you a glass of tap water with your order. 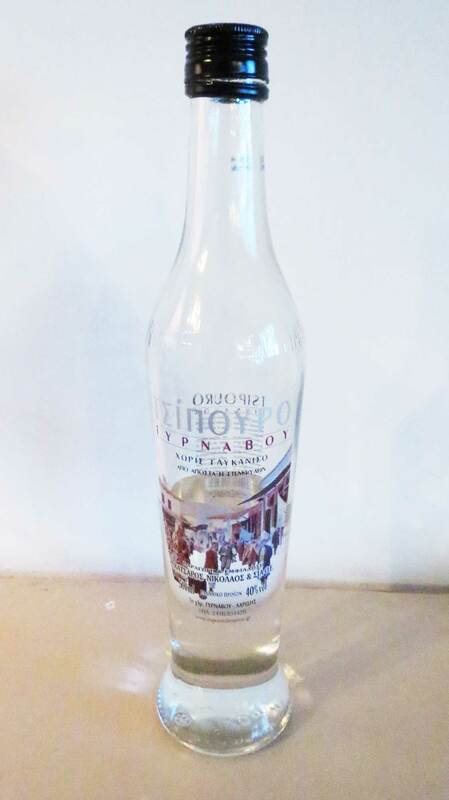 I liked Tsipouro so much that I brought a bottle home to share with friends! If you’re looking for the perfect souvenir to help you remember your trip, then check out the local markets. Start your search at the Pandroussou Street Market, first established in the 1800s, where you’ll find a wide selection of goods from across Greece. Whether you’re looking for an expensive piece of gold jewelry, herbs and spices, or a cheeky t-shirt, you’re sure to find something of interest. 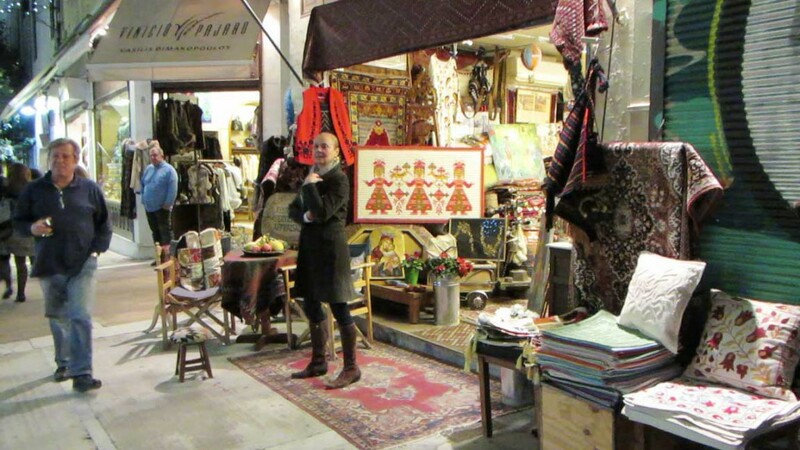 If you’re on a quest for a Greek antique or unique knickknacks, explore the Athens Flea Market on Monastiraki Square or the Sunday antiquities market on Avissinias Square. A shop owner stands outside of her shop at the Pandrossou Street Market. Pandrossou Street Market is a great place to stop and pick up a souvenir of your travels. Check out the best view of the city by climbing Lycabettus Hill, the city’s highest point standing at 277 meters (908 feet) above sea level. Climbing the hill is a great way to work off some of those extra calories from all the tasty Greek food you’ve consumed, but you can also catch a ride up the hill on the Lycabettus Funicular. A large open-air theatre is situated on top of the hill and regularly hosts Greek and international concerts, so keep an eye out for upcoming performances. Unfortunately, it poured rain on the day I had planned to climb Lycabettus Hill, so it remains one of the first things I’ll be doing on my next trip to Athens. Lycabettus Hill as taken from the Acropolis. Unfortunately, it rained on the day I’d planned to climb it, but it’s the first item on my agenda when I return to Athens. Why not take a break from the bustle of the city to check out a local beach or take a day trip to one of the nearby sights? A visit to the Temple of Poseidon makes for a fantastic half-day trip, or check out the Oracle of Delphi. It’s a two and a half hour bus ride from Athens, with a pit-stop, but well worth the time spent traveling. 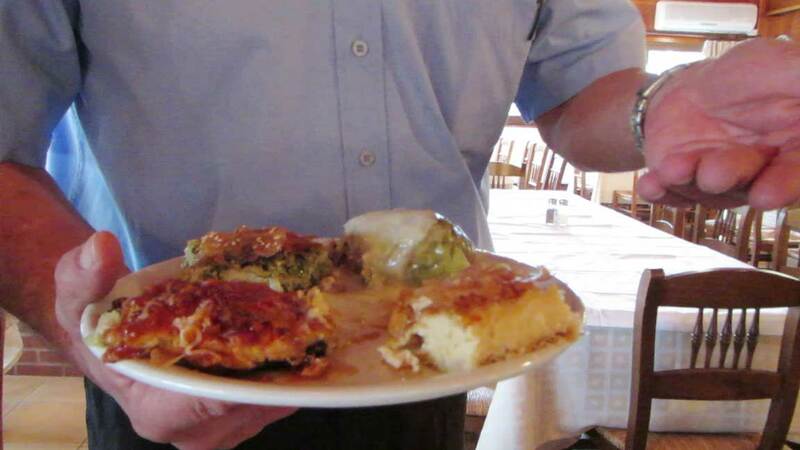 After exploring this beautiful and historic destination, stop by the town of Delphi for an afternoon feast. I traveled with Key Tours and found the guides to be very friendly and knowledgeable and the afternoon lunch to be overwhelmingly tasty. To check out my experience, view the video below.